ING Creatives, a Dubai-based organisation that supports local artists and creative professionals teamed up with Artist Ruben Sanchez for a JLT community initiative. The Spanish-born graffiti artist, Ruben Sanchez created a colourful outdoor mural with a local theme. Using 150 spray paint cans, Ruben transformed the wall – which looked so raw with meaningless words – into a beautiful piece of artwork. Ruben’s inspiration comes to him while he’s drawing the sketches. “The idea was creating itself as I was sketching.” He said. 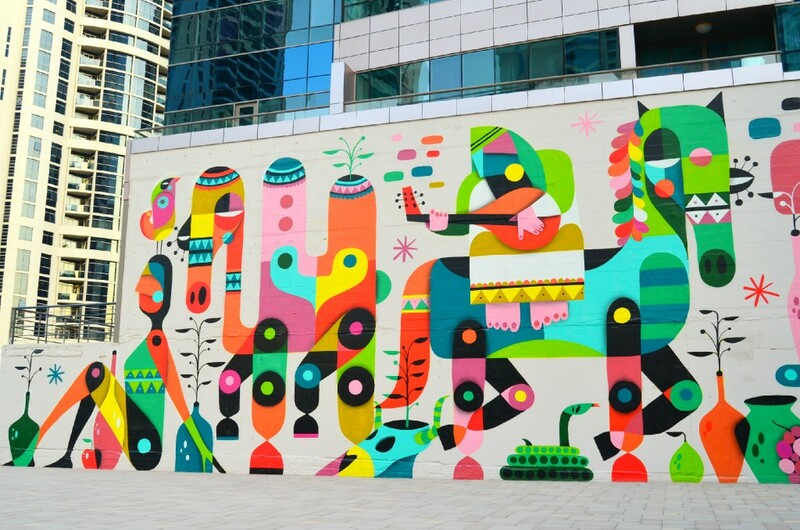 Based in the Jumeirah Lakes Towers residential area of Dubai, the community wall has a local theme behind it. “That’s basically a love story – courtship.” He continues. The local elements that inspired this artwork are evident in Ruben’s mural. “I wanted to bring things from the desert. I was playing with the local elements, like the camel.” He said. Ruben began painting on the blank wall on the 11th of February, and the artwork was completed on the 18th of February. “It took exactly seven days to complete the project.” He said. The graffiti artist describes his style as Neo-Cubism. “Since 10 years ago, I’ve been developing this style.” Ruben explained. As a strong advocate of community art projects, Ruben was very delighted to re-paint the wall. He explains that getting involved in community art initiatives is the essence of graffiti art. “Nobody was doing graffiti in the beginning to get money.” He explains. The talented artist is also happy to see the street life and street art culture evolving in the Arab region and the UAE in particular. Despite being in its novice stages, Ruben notices the street art scene progression in the city. “Now street art is getting a lot of recognition. And huge festivals are done for it.” He says. 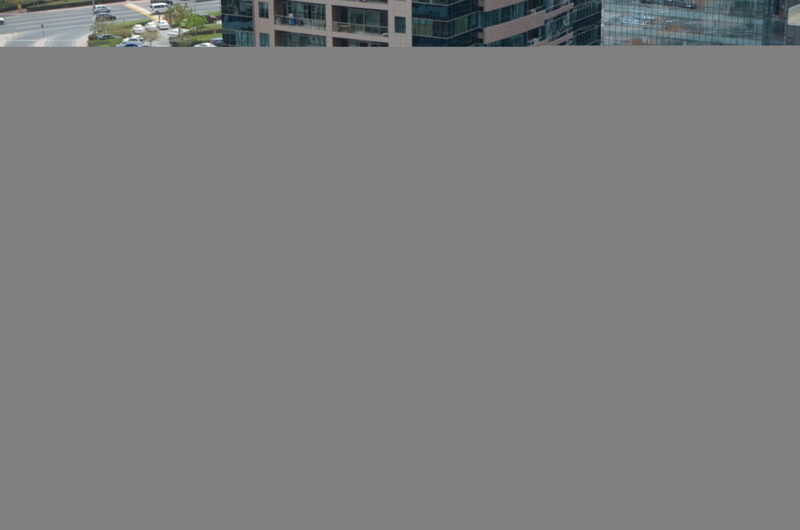 DMCC – the government entity which regulates trade for the JLT area has supported the community initiative by providing the paint and the cherry-picker (the lift) used to paint the wall. 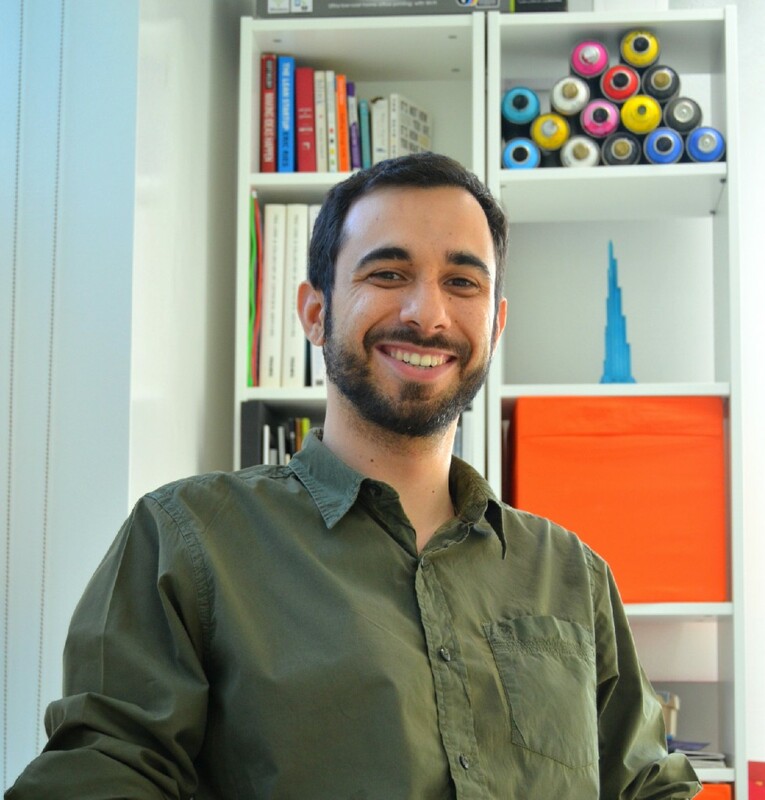 Another significant supporter to the project was Ramy Alawssy, Founder of ING Creatives. Ramy’s organisation aims to bridge the gap behind the industry and the creative professionals. Providing a platform for illustrators, designers and photographers to showcase their work is the JLT-based company’s main concept. 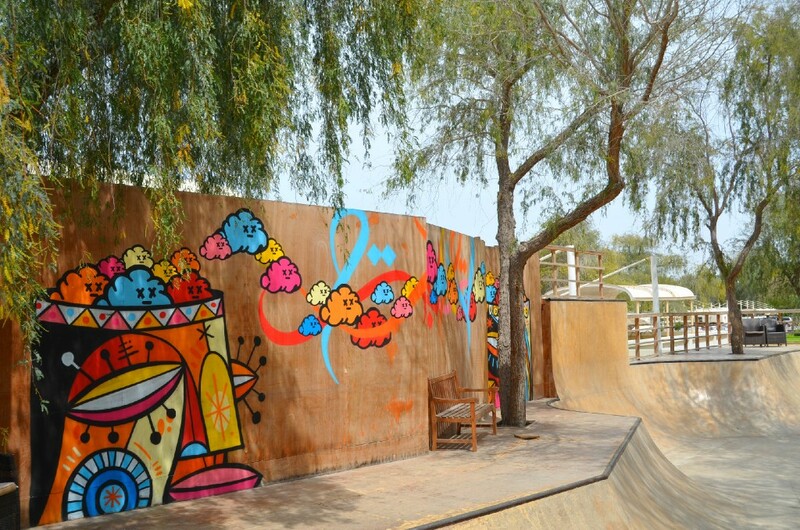 Ramy’s idea of converting the raw wall into a piece of artwork became a reality after a long waiting period. “It took DMCC one year and four months to revert with the final permission to start the work on the wall.” He said. The delayed response from DMCC didn’t hinder Ramy’s aspirations for an enhanced community experience. His hard work was clear once the work was completed as community members were happy to take photos and play around the wall. When Ruben is not painting or sketching in the studio, he can be found skating at one of the city’s newly developed parks. Skateboarding is a part of his lifestyle since he was living in Madrid. “I was skate-boarding since I was a teenager, and I was doing graffiti since I was a teenager too.” He said. The artist misses the convenience of being able to skate at any street pavement, like in Europe. Ruben finds the street life scene in Dubai very limiting, due to the city’s design and layout. “It’s very confined to designated locations. It’s not like in Madrid or Barcelona, where you just go out and go skating or walking or ride your bike anywhere.” He said. The ING creative community wall by Ruben Sanchez can be found in JLT, Dubai, Cluster V – at the lake level. ING Creatives are hosting a conference on the 27th and 28th of March, 2015. ING Creatives regularly host talks and portfolio review sessions. But this will be their first conference at this scale. The conference includes talks, workshops and portfolio reviews that are designed to motivate creatives, give them the support they need and help turn their ideas into reality. “We’re built for the creative community. We’re not built to help communities that are outside. We’re here to help the community in the UAE, in the region, because they lack the support.” Ramy said. “Some of these line-ups are great illustrators, designers, creative directors, fashion designers, and they speak at international creative conferences.” He continues. The event caters to creatives from different disciplines. “Whoever has a visual portfolio, or anybody that is in the creative field. Whether there’s photography, illustration, graphic design.” Ramy explains. “We’ll be doing it every year from now on.” He said. The tickets are 725 AED for both days including talks and portfolio reviews. The raw wall in JLT’s Cluster V had random writing on it for years, before it underwent a major beautification project by Spanish artist, Ruben Sanchez. Set in the midst of sky-scrapers, the creative community wall reminds residents of the simple old days from the Arab culture and heritage. ‘A professional dreamer’ is what the Spanish-born artist, Ruben Sanchez likes to call himself. He spends his time between sketching at his studio and skating at local parks. When Ruben works outdoors, he always uses spray paint. 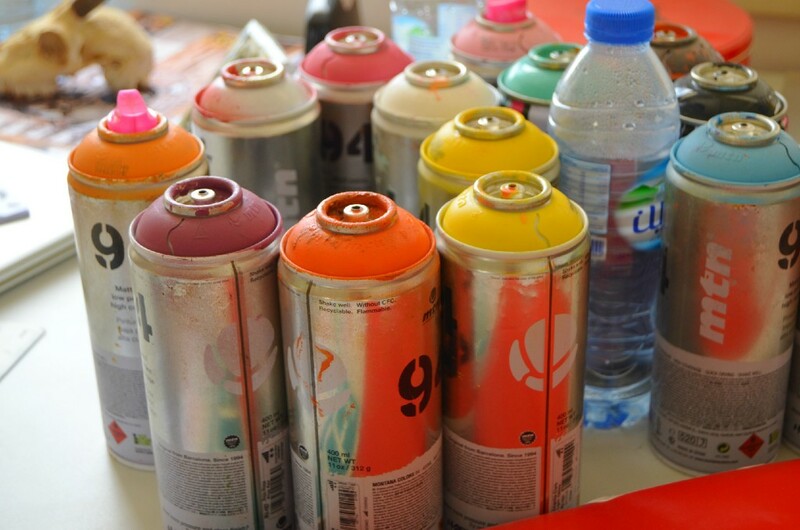 A colourful selection of spray paint cans fill the artist’s studio space. Ramy Alawssy, Founder of ING Creatives believes in supporting creative professionals in Dubai, and in featuring their work to the community. 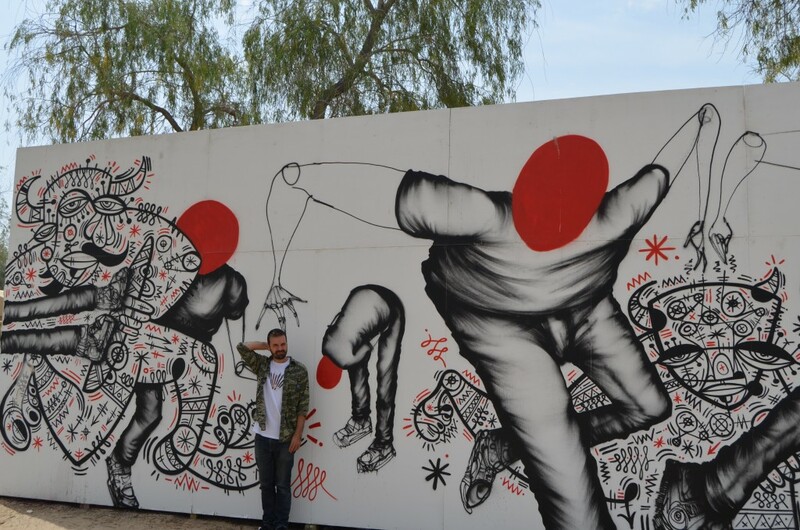 Ruben Sanchez in front of one of the murals that he has created in collaboration with other artists, at the Tashkeel Studio and Gallery spacious backyard. Another collaboration between Ruben Sanchez and another artist. The creative community wall adds a vibrant element to the lake-side community. ING Creatives’ initiatives give back to the community and support local artists simultaneously.